'America Is Great Right Now' Obama Says, Alluding To Trump's Slogan : It's All Politics Not mentioning any names, but speaking of the "presidential campaign," the president rebutted GOP criticism of his administration while speaking to business leaders in Washington on Wednesday. 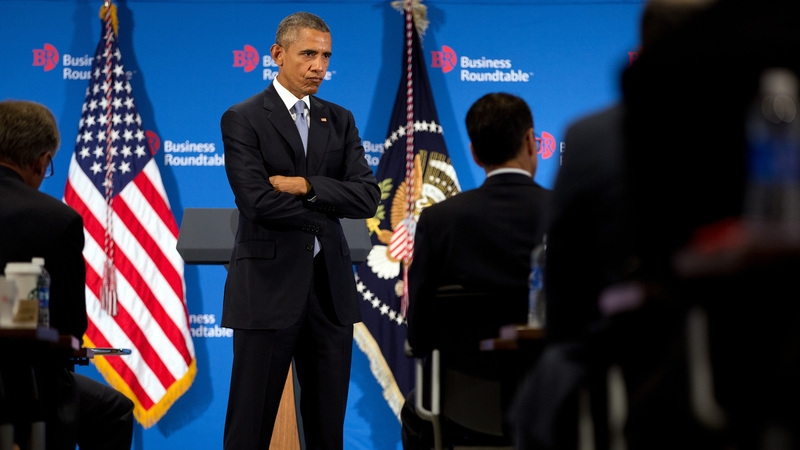 President Obama speaks during the quarterly meeting of the Business Roundtable in Washington, D.C., on Wednesday. Attention, Republican presidential candidates who say they want to make America great again! Yes, we're talking to you, Donald Trump: President Obama thinks you've got it all wrong. In remarks Wednesday morning to the Business Roundtable, a group of business executives, Obama took issue with some of the rhetoric being used by GOP presidential candidates. "Despite the perennial doom and gloom that I guess is inevitably part of a presidential campaign," Obama said, " America is winning right now. America is great right now." Obama didn't mention Trump or any of the Republican candidates by name. But there was no doubt at whom he was aiming his remarks. After all, Trump's campaign slogan is "Make America Great Again," and he has promised if elected, "We'll have so much winning you'll get bored with winning." Obama returned to the theme later in his remarks. Talking about his upcoming summit with Chinese President Xi Jinping, Obama said, "America is in the driver's seat, if we make some smart decisions." According to Obama, "there's not a country out there, including China, that wouldn't look at us with envy right now." Addressing other themes raised by Trump and other GOP candidates, Obama said, "Our problem is not that China's going to outnegotiate us" or that Russian President Vladimir Putin "is sort of outstrategizing us. Anyone take a look at the Russian economy lately?" Obama also used his remarks to chastise Republicans in Congress who are threatening a partial government shutdown at the end of the month over funding for Planned Parenthood. He said the U.S.'s "problem is we engage in self-inflicted wounds like this potential government shutdown," which he called "unnecessary."